In the context of developing simple websites without using any frameworks, the problem of website's download speed does not seem to be so critical. But if you have an app and don’t want to make users with low internet speed, it’s important to optimize the application. All images on the web page should be compressed and optimized with the appropriate tools. In that case the following websites will be quite helpful: for .png follow the page TinyPNG and for .jpg - the page TinyJPG. For to minify .svg images there is a popular command line tool SVGO that you may have a look at the GitHub repository. The style responsible for displaying the page elements, visible to the user in the first place, should be taken from the connected CSS files into the internal styles. This will allow them to work right after loading the HTML document, without waiting for the files with external styles to be loaded by the browser. If the page includes a lot of images, you should think about the advisability of implementing the functionality for delaying loading of them. For example, images can be loaded while the user is scrolling the page. And of course, we should not forget about the most popular way to replace the white screen of the loading page with something more pleasant - remember to use loaders. Following the abovementioned tips, you can significantly speed up, optimize and make more user-friendly almost any STATIC web page. But what about the SPA? Let's try to consider this case on the example of the Angular application. When the document is loaded, the browser starts downloading of the bundles (main, inline, styles, polyfills etc…). And only after loading and executing all the bundles the launch of the Angular application will be initiated and the components will be displayed. 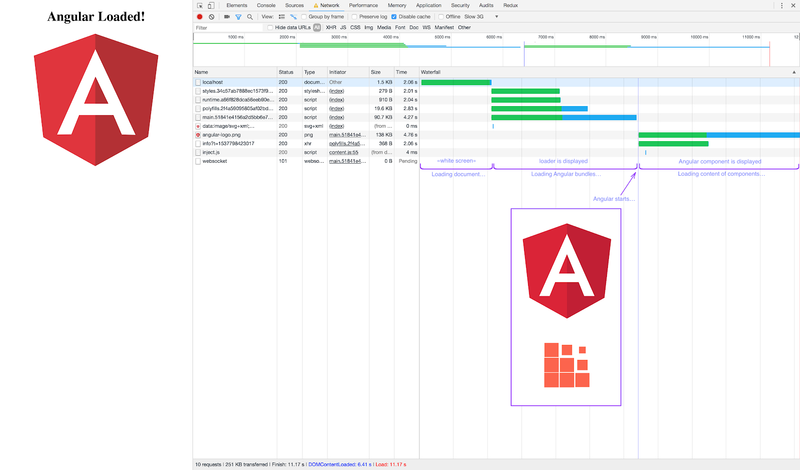 In case of a slow speed of the internet connection, the time spent for loading the Angular bundles often exceeds 10 seconds, that is a crime against UX. Thirdly, delayed loading of images will also work after rendering the component template only where they are used. It turns out that it is the most rational and the easiest to implement to work with the "white screen" in the period before the launch of the SPA using the loader. In this case, there is no need to develop the logic for the transition from the display of the loader to the display of the application itself. Namely, due to the fact that the HTML layout located inside the selector of the root component is visible to the user exactly before the Angular application starts working and renders the root component. Using this, we can arrange the layout of the loader inside the selector "app-root", and its styles - internally in the head of the document. In fact, in addition to the loader inside the selector, we can display anything within the capabilities of the static page. All this increases the volume of the original document loaded and ultimately postpones the launch of the Angular application. Suppose that we need to display the logo of the company in addition to the loader. In accordance with the abovementioned, the logo should have a minimum size, and it is desirable to be presented as a string in the base64 encoding or as the inline SVG. Here we have preview container with base64 encoded logo and animated loader. For the speedy display, we put the styles internally in the head of the document. Now, by downloading and running the Angular application, the user will see the preloading page, and as soon as the application is launched, the root component will be rendered instead. From this moment, you can start optimizing the page taking into account all the above mentioned recommendations. And again we will stop on the loader. The loader we just applied can no longer be used anywhere in the application. If there is a need to display the loader (for example, to indicate the execution time of the HTTP request), it will be necessary to create a new loader component, that will be part of the Angular application. To test the work of the loader before launching the Angular application, open Chrome Dev Tools and throttle network speed to "Slow 3G". In case you have any questions, feel free to contuct us. Angular Enthusiast, Full-Stack. CRM and ERP platforms magician. Making the life of Angular users better with OSS projects. The MVP has got core features of the product. When the early prototype is deployed to the possible customers, the development team collects information from early adopters, proves or disproves ideas.